The New Jersey Performing Arts Center is proud to present Jazz Meets Sports, a special event connecting jazz artistry and athletic performance created by Artistic Advisor and GRAMMY® Award-winning bassist Christian McBride. This special one night only program will take place on Sunday, March 2 at 7:00PM in NJPAC’s Victoria Theater. 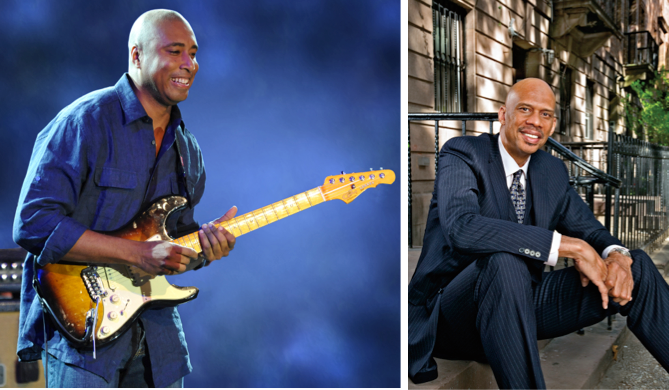 McBride is set to perform with his trio, featuring pianist Christian Sands and drummer Ulysses Owens, Jr., with baseball legend and Latin GRAMMY® nominated guitarist Bernie Williams. McBride will also moderate a conversation featuring Williams and NBA icon and ultimate jazz connoisseur, Kareem Abdul-Jabbar. Joining the bassist as a co-host of this Jazz Meets Sportsconversation is CBS sportscaster Lesley Visser, the first and only woman enshrined in the Pro Football Hall of Fame. “I wanted to find a way to combine my two passions in life. A lot of people aren’t quite sure how the two relate, but the fact is when you have a group coming together trying to make something happen, it’s all about teamwork. It’s all about trusting one another. It’s all about telepathy,” explains McBride, who has also written for The Bleacher Report. “In that sense, sports and music are the exact same thing. Obviously, music doesn’t rely on points to decide a victor, but the process is very much the same.” McBride has served as artistic director to NJPAC’s TD James Moody Democracy of Jazz Festival for the last two years, and joined the arts center as a Jazz Advisor for the entire 2013-14 concert season and as curator for his own series of concerts. The bassist isn’t alone in recognizing the similarities between jazz and sports. Bernie Williams, co-author of Rhythms of the Game: The Link Between Music and Athletic Performance, had a celebrated 16-year career with the New York Yankees as a four-time World Series Champion and five-time All Star. The MLB center fielder continued to pursue his passion for music with his debut album in 2003, The Journey Within, featuring fusions of jazz, rock, and tropical rhythms. His follow up album, Moving Forward, includes guest appearances by heavyweights including Bruce Springsteen, Jon Secada, Dave Koz, Wayman Tisdale, and more. Six-time NBA Champion and 19-time NBA All-Star Kareem Abdul-Jabbar was a “no-brainer,” says McBride. “I met Kareem back in 1991, everyone knows what a jazz connoisseur he is and how much he’s really gone out on a limb to listen to jazz and promote jazz and champion jazz. “The New York Times best-selling author has written six books, including his autobiography, Giant Steps, where the title pays homage to the legendary John Coltrane. Abdul-Jabbar is also a pop-culture columnist for Esquire.com and just launched his own sports memorabilia company, StarGuardCollectibles.com. Abdul-Jabbar also did a piece for Jazz Times on the connection between jazz and basketball. In addition to his virtuosity as a bass player, Christian McBride is an educator, curator and composer-arranger. The Philadelphia-born musician has performed alongside a diverse set of luminaries including Chick Corea, Herbie Hancock, Natalie Cole, Pat Metheny, James Brown, Sting, Bruce Hornsby and Queen Latifah, among others. Tickets may be purchased by telephone at 1-888-GO-NJPAC (1-888-466-5722), at the NJPAC Box Office at One Center Street in downtown Newark (open Tuesday-Saturday, noon to 6:00pm; and Sunday, noon to 5:00pm), or online at www.njpac.org.